The seminar series, Homological Mirror Symmetry, will be held on selected Thursdays from 2PM – 4pm in CMSA Building, 20 Garden Street, Room G10. Abstract: This is the first talk of the seminar series. We survey the statement of Homological Mirror Symmetry (introduced by Kontsevich in 1994) and some known results, as well as briefly discussing its importance, and the connection to other formulations of Mirror Symmetry and the SYZ conjecture. Following that, we will begin to review the definition of the A-side (namely, the Fukaya category) in some depth. No background is assumed! Also, in the last half hour, we will divide papers and topics among participants. Abstract: In the second talk, we review (some) of the nitty-gritty details needed to construct a Fukaya categories. This include basic Floer theory, the analytic properties of J-holomorphic curves and cylinders, Gromov compactness and its relation to metric topology on the compactified moduli space, and Banach setup and perturbation schemes commonly used in geometric regularization. We then proceed to recall the notion of an operad, Fukaya’s differentiable correspondences, and how to perform the previous constructions coherently in order to obtain $A_\infty$-structures. We will try to demonstrate all concepts in the Morse theory ‘toy model’. which use homological algebra techniques and formal deformation theory of Lagrangians etc. 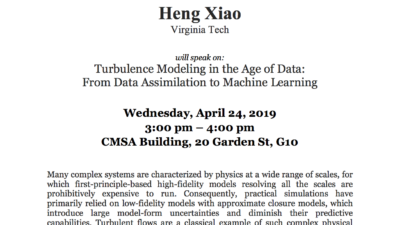 Abstract: We will review the semi-flat mirror symmetry setting in Strominger-Yau-Zaslow, and discuss the correspondence between special Lagrangian sections on the A-side and deformed Hermitian-Yang-Mills connections on the B-side using real Fourier-Mukai transform, following Leung-Yau-Zaslow. Abstract: While mirror symmetry was originally conjectured for compact manifolds, the phenomenon applies to non-compact manifolds as well. In the setting of Liouville domains, a class of open symplectic manifolds including affine varieties, cotangent bundles and Stein manifolds, there is an A-infinity category called the wrapped Fukaya category, which is easier to define and often more amenable to computation than the original Fukaya category. In this talk I will construct it, along with symplectic cohomology (its closed-string counterpart), and compute some examples. 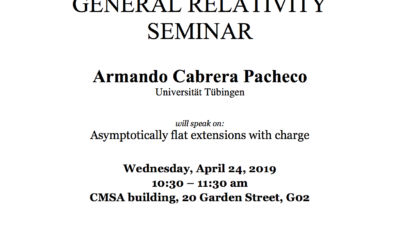 We will then discuss how compactifying a symplectic manifold corresponds, on the B-side of mirror symmetry, to turning on a Landau-Ginzburg potential. According to the SYZ conjecture, the mirror of a Calabi-Yau variety can be constructed by dualizing the fibers of a special Lagrangian fibration. Following Auroux, we consider this rubric for an open Calabi-Yau variety X-D given as the complement of a normal crossings anticanonical divisor D in X. In this talk, we first define the moduli space of special Lagrangian submanfiolds L with a flat U(1) connection in X-D, and note that it locally has the structure of a Calabi-Yau variety. The Fukaya category of such Lagrangians is obstructed, and the degree 0 part of the obstruction on L defines a holomorphic function on the mirror. This “superpotential” depends on counts of holomorphic discs of Maslov index 2 bounded by L. We then restrict to the surface case, where there are codimension 1 “walls” consisting of Lagrangians which bound a disc of Maslov index 0. We examine how the superpotential changes when crossing a wall and discuss how one ought to “quantum correct” the complex structure on the moduli space to undo the discontinuity introduced by these discs. 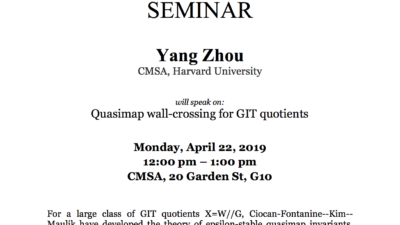 I will present Auroux-Katzarkov-Orlov’s proof of one side of the homological mirror symmetry for Del Pezzo surfaces. Namely I will prove their derived categories are equivalent to the categories of vanishing cycles for certain LG-models together with B-fields. I plan to show how the general B-field corresponds to non-commutative Del Pezzo surfaces and time allowing may mention HMS for simple degenerations of Del Pezzo surfaces. The tools include exceptional collections( and mutations for degenerate case), explicit description of NC deformations, etc. Abstract: In this talk I will discuss the Fukaya category of a toric manifold following the work of Fukaya-Oh-Ohta-Ono. I will start with an overview of the general structure of the Fukaya category of a compact symplectic manifold. Then I will consider toric manifolds in particular the Fano case and construct its mirror.